Significant tissue salvage has been demonstrated using our patented catheter-based cooling technology. In a 9 animal myocardial ischemia/reperfusion study rapid localized cooling was applied for a total of 35 minutes. Cooling was initiated 50 minutes into a 60 minute occlusion period and continued for 25 minutes following reperfusion. A controlled re-warming was then conducted for 5 minutes. _At a blood flow rate of approximately 50 ml/min cooled blood was delivered to at risk tissue causing temperature reductions of approximately 3°C in 5 minutes. The tissue damage represented by the ratio of infarct size over area at risk (IS/AAR) for the rapid localized cooling group was significantly smaller compared to normothermic controls: 35.5±19.1% vs. 49.8±2.0% (p=0.049, un-paired, one-tailed, unequal variance t-test). 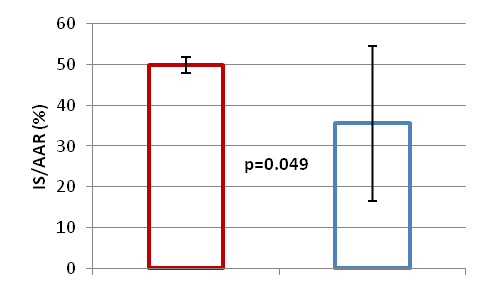 There was no significant difference in AAR between groups (p=0.17). 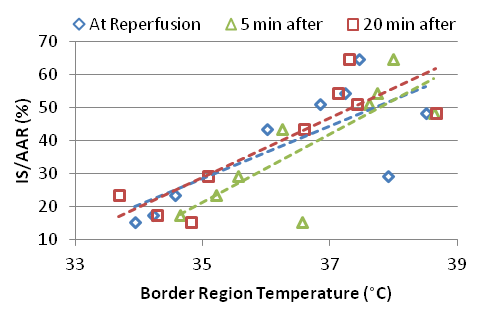 There was also a positive correlation between border region tissue temperature and myocardial salvage at reperfusion, 5 min after, and 20 min after reperfusion.